Happy New Year to you also, Geraldine. I hope it is a good year for you and Mr. Cheddar. 🙂 Thanks for reading and commenting on my posts this last year. It was much appreciated. 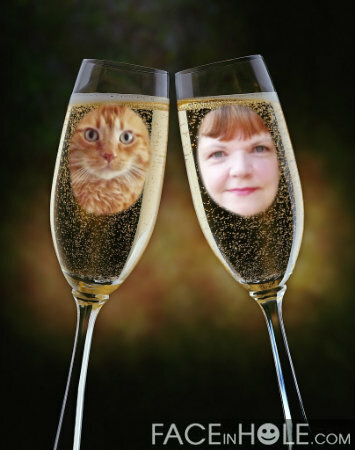 Love the toasting flutes! Happy New Year to you, also! Thanks for the Alaskan hug, how I miss the North! Hopefully will be living in the Yukon again and soon! Oh Genie, love all those pretty icons. Thanks so much! And to you too Joyce, glad we’ve stayed in touch via our respective blogs, for many years now. All the best to you and your family in the New Year. I thought this was kinda cute Carole. More hugs to you, take care! Delightful! All the best to you and your loved ones, Geraldine! I love this. Happy New Year to everyone.